Went to Shij1azhuang for a weekend business trip and spotted this in the bathroom of my hotel room. I have no idea what the first line was saying (without looking at the Chinese translation). I am guessing that perhaps Condoleezza Rice and Bill Gates shared this very bathroom that I am standing in? Arrenn & Ashley: Yes. 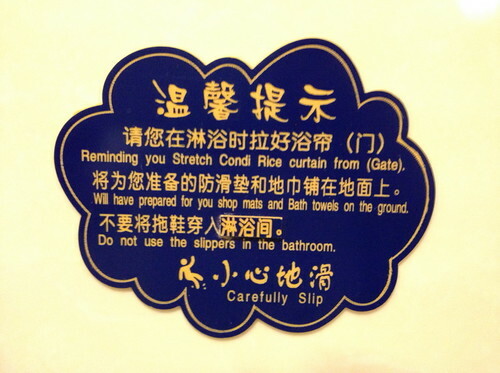 I make sure to slip carefully, lest I be caught falling in a very unglam fashion. Oh the horrors!